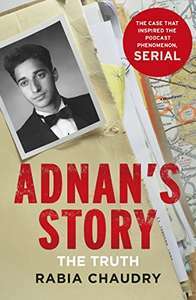 Adnan's Story: The Case That Inspired the Podcast Phenomenon Serial by Rabia Chaudry Kindle Edition 99p @ Amazon. On February 28, 2000, Adnan Syed was convicted and sentenced to life plus thirty years for the murder of his ex-girlfriend Hae Min Lee, a high school senior in Baltimore, Maryland. From the moment of his arrest, Syed has consistently maintained his innocence. Rabia Chaudry, a family friend, always believed him and has never given up the hope that he might someday be released. By 2013, however, after almost all appeals had been exhausted, things looked bleak. That's when Rabia contacted Sarah Koenig, a producer at This American Life, in the hopes of finding a journalist who would bring greater attention to Adnan's story and might shed new light on the case. Koenig's investigation turned into Serial, an international phenomenon and Peabody Award-winning podcast. Adnan's Story will reexamine the investigation that led to Adnan Syed’s arrest, share his life in prison, cover new evidence and possibilities that have since come to light, and review the recent court successes - including a ruling by a Maryland judge to reopen Syed’s case. Woven with personal reflections from Adnan himself, including new never-before-seen letters he penned from prison, the story of his family, community, and public advocate Chaudry, the book offers new insight into the story that captivated the attention of millions as his legal team and investigatory team, along with countless others who have crowd-sourced an investigation like never before, seek to exonerate him and find out the truth of what really happened on that day in 1999. What has captivated the public about Adnan's story are the layers of contradictions, fascinating characters, cultural dissonance, and fog of ambiguity around what really happened to Hae Min Lee. But this is not just a personal story, it is a testament to a thoroughly broken system that convicts tens of thousands of innocent people, and how the power of the media and public can move rigid institutions to bring about justice. Watched the 4 part series aired recently. Was edge of the seat stuff. I went from couch potato to detective in the pop of a pringle. Free on borrow box! Very biased book by Rabia. Conclusion is nothing at all can be proved in this case! Agree. Everyone should listen to the Serial podcast before watching the TV series, IMO. I’m not usually one for podcasts, but Serial is addictive and so well done. Watched the 4 part series aired recently. Was edge of the seat stuff. I …Watched the 4 part series aired recently. Was edge of the seat stuff. I went from couch potato to detective in the pop of a pringle. U need to chk the podcast that first brought this case to the publics attention. What did you watch it on? Don't put money in this woman's pocket for Christs sake. She's mental and has no proof whatsoever that he's not guilty. Don't put money in this woman's pocket for Christs sake. She's mental and …Don't put money in this woman's pocket for Christs sake. She's mental and has no proof whatsoever that he's not guilty. Remember in the US, you have to be proven guilty without a shadow of doubt. All the bias, inconclusive facts against him due to ethnicity and faith means its a mistral end of. Its been years since the podcast. It missed a lot of things out which point to his guilt. Its been years since the podcast. It missed a lot of things out which …Its been years since the podcast. It missed a lot of things out which point to his guilt. Also missed a lot of things that suggest his innocence (undisclosed podcast, anyone?) Like I said, the conclusion I felt was fair and probably still stands. Anyway, just like many things it comes down to opinion. Mine is no more valid than anyone elses. Also missed a lot of things that suggest his innocence (undisclosed …Also missed a lot of things that suggest his innocence (undisclosed podcast, anyone?) Like I said, the conclusion I felt was fair and probably still stands. Anyway, just like many things it comes down to opinion. Mine is no more valid than anyone elses. That’s irrelevant now. Yes he got a bad trial but there’s no doubt the cor …That’s irrelevant now. Yes he got a bad trial but there’s no doubt the correct person is locked up and that’s why he wasn’t given a retrial. How is there no doubt? There are multiple things that don’t add up in J …How is there no doubt? There are multiple things that don’t add up in Jay’s story, which is what it is at the end if the day, a story, and the cell tower evidence was inaccurate. Why didn’t the police ever run the DNA tests? Seriously suspect policing. Why didn’t his lawyer present Asia as a witness? If Adnan had given the story Jay did, you/people would be saying Jay did it. We don’t know for sure who did it, but there is no doubt that the policing and the trial was flawed throughout, and everyone deserves a fair trial. Arguably, the reason so many people are refused a retrial is because the state/government then has to take responsibility and acknowledge that they f*cked up in the original trial, in addition to the fact it costs the state money.